If you were to travel to Lithuania you might encounter some traditional houses adorned with the motif of two horse heads. You might take this as a simple design but it is in fact a small clue to Lithuania's deep and ancient Vedic past. Traditionally, the Vedic peoples of Lithuania worshipped the Ašvieniai, the divine horse twins, related to the goddess Ūsinis. They are said to pull the Sun Chariot through the sky. The Lithuanian people continue to adorn their roof tops with the symbol of the divine horse twins in order to receive protection for the household. In India the complete Vedic tradition has been preserved. There the divine horse twins are known as the Ashvins, the children of the Sun god Surya, who are summoned by the goddess Ushas (morning dawn) and appear as the morning and evening sunlight. They are often known as Nasatya (Kind, Helpful) and Dasra (Enlightened Giving). They are practitioners of Ayurveda as the doctors of the devas (demigods), and it is for this reason that people adorn their roofs with their image - so that the residing family may remain healthy. They are most notable for granting the divine twins of King Pandu - Nakula and Sahadev, who along with Yudhisthira, Bhima, and Arjuna made up the Pandavas of the Mahabharata. In the Anglo-Saxon tradition also, it is said that two German brothers Hengist ("Stallion") and Horsa ("Horse") led the armies that conquered Britain. 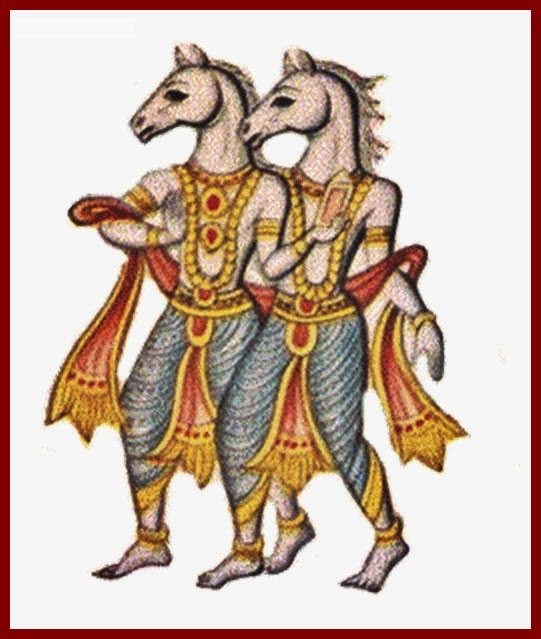 Many believe this is a continuation of the original tradition of the Vedic horse twins. Similar to Lithuania, you will find the same tradition of horse-headed gables on roofs throughout Germany in honor of Hengist and Horsa. So the next time you travel through Europe and see these horse gabled roofs, smile and realize their connection to Europe's ancient Vedic past.